Summer is well and truly here and that can mean only one thing… Well, of course it means a lot of things, but one of the things it means is that it is time for the annual TaG Award, that highly sought-after prize for excellence in gaming which changes its name pretty much every year. Last year it was known as the Golden Game Award, and before that it was the Golden Thingummy, but now Miss B has settled on the TaG Award, which seems fitting. Our four shortlisted games for this year, lined up and almost ready to go. Anyway, the rules are similar to previous years, but with a slight enhancement. The shortlist is made up of two games chosen by Miss B and two games that I choose to round things out a bit. We then play two game-offs, each playing two of the games in one day and selecting one from each game-off to go through to the grand final. The final works in the same way, and results in one game being given the much coveted TaG Award. In previous years, Miss B has had sole discretion in choosing the winners, but this time around she wanted me to have a say, so now we are each scoring the games we play out of ten (based on how much we enjoyed playing on the day) and adding our scores together to get a score out of twenty. In the event of a tie, Miss B has a casting vote. 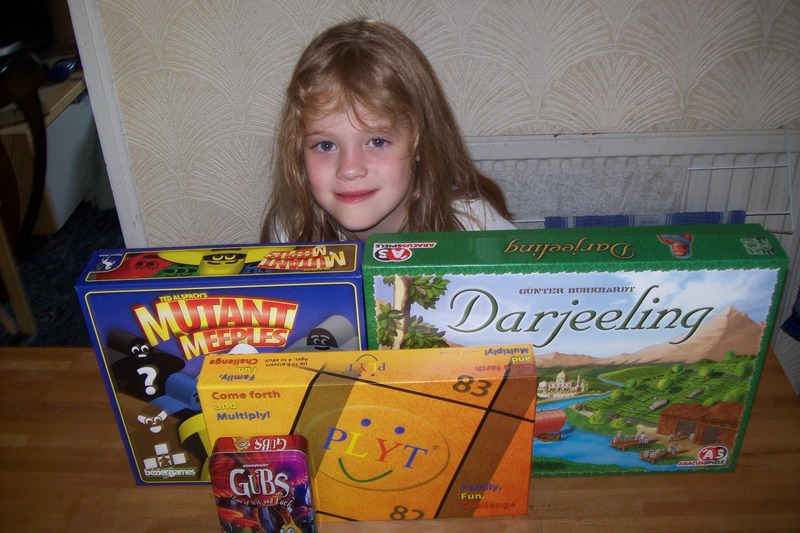 “I chose Plyt because it is a game that has helped me think harder and quicker in maths. It is also fun and enjoyable. Two good choices there. I think an honourable mention has to go to Flippin’ Fruit, which was on the list briefly, but then Miss B changed her mind in favour of Mutant Meeples. My choices were Gubs, because it is so much fun and we played it quite a lot over the last year, and Darjeeling, which we have only played a couple of times so far, but which has the potential to become a firm favourite. I await the results of the TaG gameoffs with bated breath! Please tell Miss B that I am quite interested to hear her opinions and comments; and I look forward to what she has to say on your final results. Thanks! Your March Madness thing looks like a good bit of fun, so thanks for linking to it. These awards are a good excuse for us to get a couple of plays in of certain games that we often overlook on a week-by-week basis. I’m looking forward to the end result, as I never have any idea of what’s going to happen. I mean, a couple of years ago Miss B declared it a tie! I took GUBS on holiday with us last week and it has already clocked up something like 16 plays – my 6 year old in particular loves it! Though I refuse to play with the “Dangerous Alchemy” card which causes the whole of your played cards to disappear if you have the misfortune to draw it…! It’s a great family-friendly, relatively gentle take-that game, isn’t it? I see where you’re coming from with the Dangerous Alchemy. Miss B got hit with that last time we played (which needs to be written up as game-off #1, so here’s a bit of a spoiler!) when she had something like 8 gubs to my one-trapped-in-a-sud-spout, which was horrific. However, she took it on the chin and kept going in good humour, which made me very proud. I think if this game teaches her that stuff happens, carry on, then it’s a very valuable experience. You’re probably right though: removing the card probably makes for a much less stressful experience. Gaming in July Is that one actually a troll?